New revised 3rd edition. 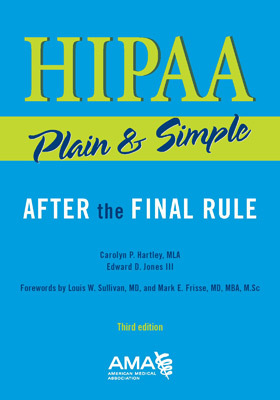 Straightforward guide simplifies the complex HIPAA regulations for those in the medical office who have direct patient contact or are responsible for safeguarding patient information. Understand the complex regulations of HIPAA and HITECH so your office can take action and achieve HIPAA compliance. The final omnibus rule for HIPAA is anticipated to publish in autumn 2012, bringing with it stronger HIPAA privacy and security safeguards and better protection for electronic health data. Trust in the AMA to provide you with the latest and most up-to-date information on HIPAA and HITECH. Authors Carolyn Hartley and Ed Jones return again to deliver the details and analysis you need to better understand the ins and outs of compliance. This third edition expands upon the topics of enforcement, the accounting of disclosures, and contracts with and disclosures to business associates while providing new content on migrating to operating rules and meaningful use.